Fox News anchor Mike Huckabee urged fans to bombard Houston city officials with opposition to a proposed non-discrimination ordinance, baselessly asserting that the measure would "be unsafe for women and children." On April 21, Houston Mayor Annise Parker (D) unveiled a non-discrimination proposal, which would prohibit discrimination on the basis of race, skin color, religion, national origin, age, disability, sexual orientation, and gender identity. The ordinance would apply to city employers, housing, city contractors, and private employers with more than 50 employees. According to the Greater Houston Partnership, fewer than seven percent of private employers in the city employed more than 50 people in 2011. Additionally, the measure exempts religious organizations. The modest scope of the proposal didn't stop Huckabee from waging an apoplectic attack on it in the form of a May 10 Facebook post. 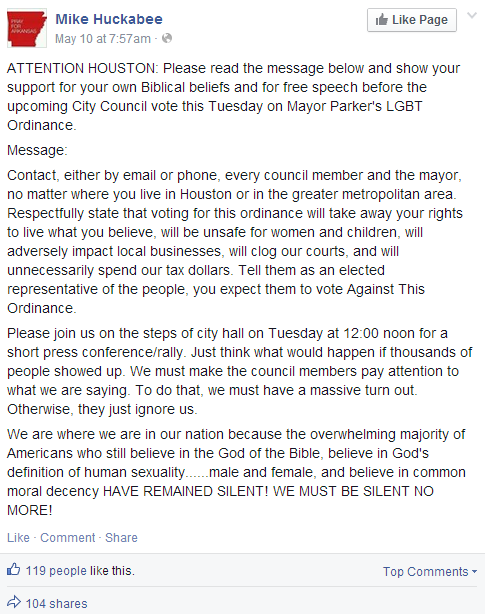 Calling on Houston-area residents to "support your own Biblical beliefs," he instructed them to contact Parker and city council members in opposition to the proposed ordinance and announced a May 13 rally "on the steps of city hall." This isn't the first time Huckabee has resorted to hysterical, factually groundless arguments to crusade against basic non-discrimination protections. In 2012, he condemned a proposed non-discrimination ordinance in Kansas by stoking fears about inappropriate bathroom and locker room behavior. Conservatives relied on such fear-mongering in their unsuccessful campaigns against transgender protections in Maryland and California, even though states and localities that have already implemented transgender protections haven't witnessed spikes in sexual assault in restrooms and locker rooms. Such facts notwithstanding, opponents of the Houston ordinance have taken to calling it the "Sexual Predator Protection Act." Huckabee's attack on the ordinance echoes other conservative claims against anti-discrimination measures, including a San Antonio ordinance passed last fall. In both cases, opponents have ignored the measures' explicit religious exemptions to argue that the proposals would imperil religious liberty and overlooked data indicating that anti-LGBT discrimination is bad for businesses and local economies. 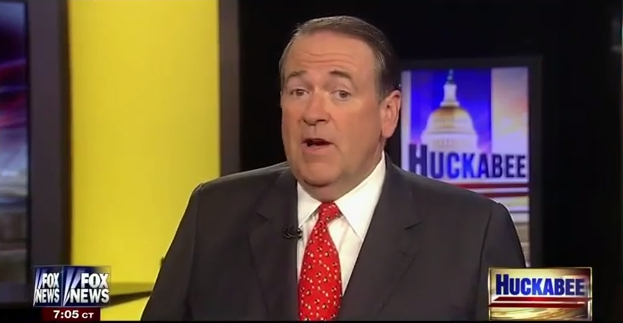 Just last month, Huckabee made headlines when he declared that he's "not a hater" and "not homophobic," simply a believer in the Bible. As he wages a campaign of malicious smears to combat even proposals with clear religious exemptions, such claims appear increasingly untenable.